谢锋, 朱芳, 刘峥嵘, 王红岩, 赵晓丹, 樊小刚. 经皮穿刺治疗经内镜引流失败的恶性梗阻性黄疸[J]. 中国医科大学学报, 2018, 47(2): 137-140. Xie Feng, Zhu Fang, Liu Zhengrong, Wang Hongyan, Zhao Xiaodan, Fan Xiaogang. Percutaneous Puncture to Treat Malignant Obstructive Jaundice in Patients Who Fail Endoscopic Drainage[J]. Journal of China Medical University, 2018, 47(2): 137-140. Abstract: Objective To study the efficacy of percutaneous transhepatic cholangiodrainage (PTCD), percutaneous gallbladder drainage, and percutaneous transhepatic biliary stent implantation for the treatment of malignant obstructive jaundice in patients who are observed to fail endoscopic drainage.Methods We retrospectively analyzed 17 patients diagnosed with obstructive jaundice between August 2015 and July 2017 who were observed to have failed endoscopic drainage. 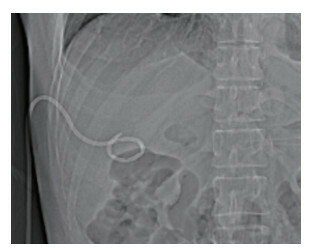 Percutaneous puncture drainage had been performed in all patients-different methods were chosen based on the type of lesion and the patient's intraoperative condition. Among these patients, 9 underwent percutaneous transhepatic biliary stent implantation (53%), 5 underwent PTCD (29%), and 3 underwent percutaneous gallbladder drainage (18%). The serum levels of total bilirubin (TBIL) and alanine aminotransferase (ALT) were assessed a day preoperatively and a week postoperatively. The postoperative decrease (or drop) in the serum TBIL and ALT levels was used as a parameter to assess the efficacy of treatment. Patients were divided into a stent and a tube group. The therapeutic effects were compared between the groups in terms of the drop in the serum TBIL and ALT levels and the survival time of patients.Results The postoperative serum TBIL and ALT levels were significantly decreased in all patients (P < 0.05). No statistically significant difference was observed between the stent and the tube group in terms of the decrease in serum TBIL and ALT levels (P > 0.05). 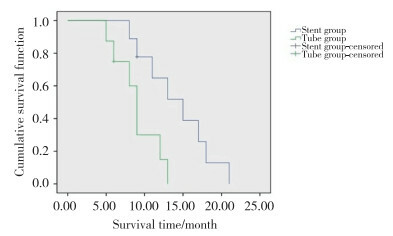 However, a statistically significant difference was observed between the stent and the tube group in terms of the survival time of patients (P < 0.05).Conclusion Percutaneous puncture is an effective treatment modality to manage malignant obstructive jaundice in patients who fail endoscopic drainage. Compared to tube drainage, stent placement can prolong patient survival time. Regarding the decrease in serum TBIL and ALT levels, we conclude that stent implantation is not significantly better than tube drainage. DE SIMONE W, CRAFA F, NOVIELLO A, et al. Bilirubin removal with coupled plasma filtration and adsorption in patients affected by hilar cholangiocarcinoma[J]. G Ital Nefrol, 2017, 34(11/12): pii 2017-vol6. KONDO M, OKAMOTO E, TAKAGI K, et al. 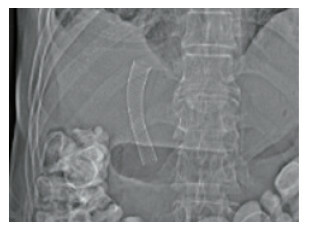 Insertion of percutaneous transhepatic biliary endoprosthesis for unresectable lower cholangiocellular carcinoma following cholangitis due to endoscopic biliary plastic stent obstruction[J]. Gan To Kagaku Ryoho, 2013, 40(12): 1777-1779.